GlobalGiants.Com - Elite Cultural Magazine: President of India releases the National Institutional Ranking Framework (NIRF) Rankings - 2019 and the Atal Ranking of Institutions on Innovation Achievements. President of India releases the National Institutional Ranking Framework (NIRF) Rankings - 2019 and the Atal Ranking of Institutions on Innovation Achievements. 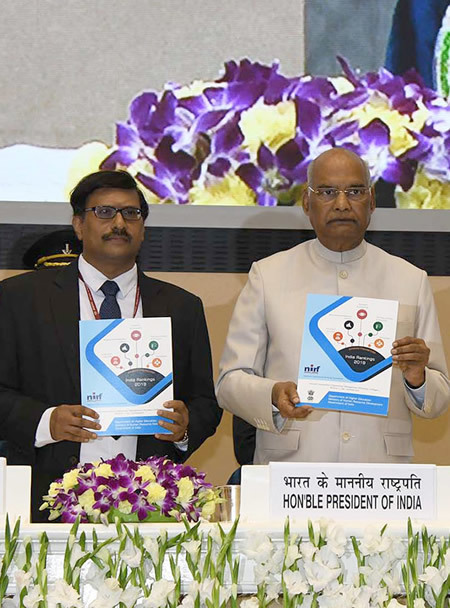 Photo: The President, Ram Nath Kovind, releasing the National Institutional Ranking Framework (NIRF) Rankings 2019, at a function, in New Delhi on April 08, 2019. The Secretary, Department of Higher Education, R. Subrahmanyam, is also seen. New Delhi, April 08, 2019 — The President of India, Ram Nath Kovind, released the National Institutional Ranking Framework (NIRF) Rankings - 2019 and presented the India Rankings awards to the top eight institutions in different categories at a function held in New Delhi today. He also released the Atal Ranking of Institutions on Innovation Achievements (ARIIA) and presented the ARIIA awards to the top two institutions. The President said that recent expansion of higher education in India had widened access and improved equity. Even so, quality remains a concern. While there are islands of excellence, both in the public and private sectors, overall standards are uneven. As our higher education infrastructure continues to grow, and as enrolment rises, it is vital to lift the bar. A nuanced approach is essential to ensure that higher education fulfills not only individual aspirations but also achieves national goals and priorities. The President noted that besides overall rankings, there are category-specific rankings for colleges and universities, as well as subject-specific rankings for engineering, management, pharmacy, architecture, law, and medicine. He said that a ranking system of such a nature fosters a spirit of healthy competition between institutions. All institutions are today competing for talent - teaching talent, research talent, the most talented students, and even the most enlightened administrators. If an institution wants to attract the best, it too has to be among the best. It has to provide an encouraging atmosphere and suitable campus culture for students and members of the academic community. The President said that it is critical that there be a significant Indian presence in global rankings of leading universities and higher educational institutions very shortly. We live in the age of the Fourth Industrial Revolution, amid a knowledge society and an innovation economy. We cannot realize our potential without the necessary education infrastructure - measured both by numbers and standards. That is why the keen sense with which institutions participate in the India Rankings mechanism should persist and be escalated to striving for and achieving rankings among the global best.